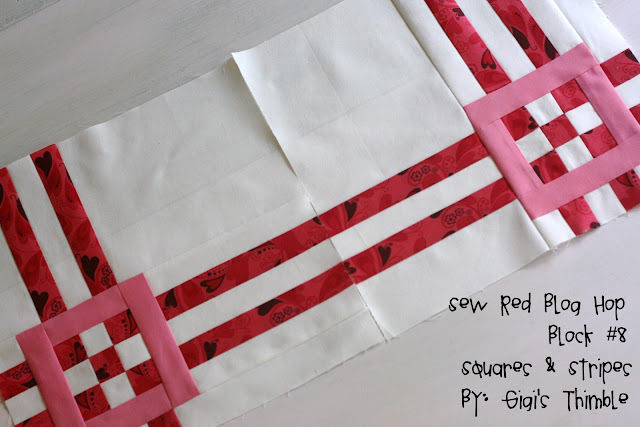 Gigi's Thimble: Sew Red Blog Hop + Block Tutorial! I am really proud to be participating in the Sew Red Blog Hop. In case you haven't heard about it yet, it is a blog hop that has been going on since February. Those of us participating in it are trying to raise more awareness about Heart Disease (which is the leading cause of death among women in the US). Leah from Burgundy Buttons is the mastermind behind the Hop and she has asked a bunch of bloggers to design a 12" block, share a tutorial for it and then donate two of those blocks to her and the girls over at B.B. so they can put them into a finished quilt that will be auctioned off! You can click HERE for more details! The fabrics I am using (along with the rest of the Blog Hop contributors) is called Chemistry by Cosmo Cricket. But of course, this little number would look cute in lots of different color ways. ﻿These instructions make two 12" finished blocks. P.S. WOF stands for width of fabric (which is approx. 42"). P.S.S. Make sure you have an accurate 1/4" seam allowance. with the red strip in the middle (WRW). Cut off the ends to make a straight edge. Then cut two 1-1/2" rectangles from that WRW section. These are for the middle row in the 9-patch blocks so you can set these aside for a little while. We'll get back to these later. Then cut two 1-1/2" rectangles and two 6-1/2" rectangles as shown below. 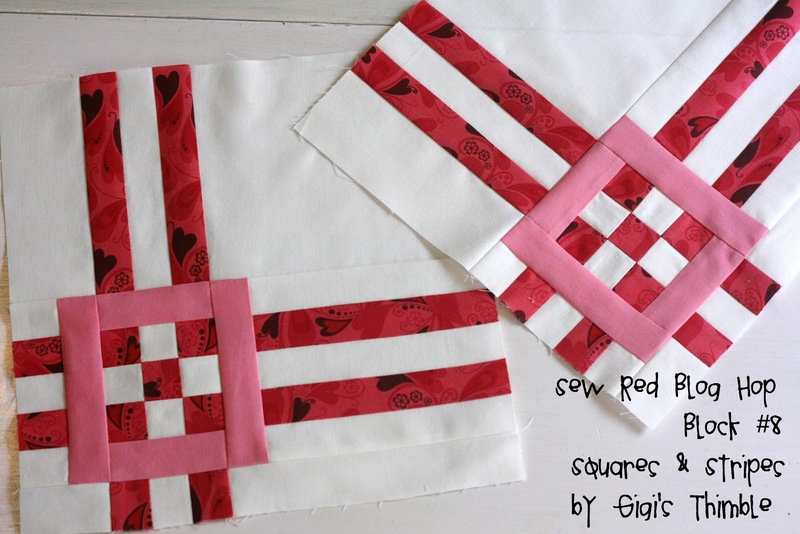 Now sew together two red and one white 1-1/2" x WOF strips with the white strip in the middle (RWR). Press seams towards the red fabric. Then cut six 1-1/2" rectangles and two 6-1/2" rectangles. Now let's sew all the pieces together! Then sew the two 1-1/2" x 5-1/2" pink rectangles to each side. Press seams towards the pink. Finally, make the top and bottom sections (see photo below). and then sew all three sections together. Repeat these steps to make your second block. I hope you liked this tutorial and I do hope you'll stop by the Sew Red Blog to find out more information about Heart Disease and what you can do to help raise awareness. Thanks for stopping by! This is a beautiful block. Thanks for the tutorial. Fantastic block--never seen one like it! I hope you don't mind that I pinned it? awesome block, i love it! WOW! I absolutely LOVE your block. It's just wonderful. Awesome job!! Thank you. I just came across the Sew Red for Women blog tour & am getting caught up on everyone's blocks! Your block is beautiful!! I saw a kit for your block at Burgundy Buttons and I fell in love instantly! Thank you for creating this very versatile block. I'm going to have to make several and play with placements. I appreciate the many pictures on your tutorial. With exposure to so many beautiful designs, I have found the simplest ones most appealing. Thank you for your creativeness.